Some downloads may require Adobe Acrobat Reader. 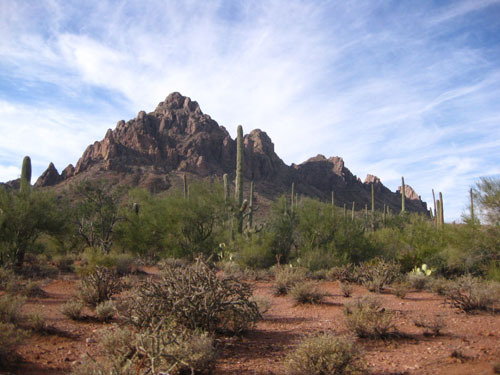 The Ironwood Forest National Monument Monument is 129,000 acres. It's boundary to the north is the north side of the Sawtooth Mountains and the boundary to the south is the northern section of the Roskruge Mountains. It is difficult to include the entire Monument boundary on one map and make it readable. The western boundary is depicted in these maps by a heavy yellow line. These maps were made by Dove Mountain Hikers and they have no affiliation with the Friends of Ironwood Forest or with the BLM. The tracks on these maps were created by actual GPS tracks recorded during hikes in the Ironwood Forest National Monument, uploaded to National Geographic Mapping Software which was used to develop the attached Maps. These tracks do not represent trails. They are routes that were hiked / bushwhacked to various destinations. Also BLM is currently drafting a revised Transportation Management Plan for the IFNM and all the roads depicted on the map may not be open after the transportation plan is finalized and approved. Other than volunteer work projects in the Sawtooth Mountains to the north and El Cerrito de Represso off of Manville Road to the south, all of the documented hiking has been in and adjacent to the Waterman Mountains, Silver Bell Mountains and Ragged Top. If you are planning to hike to one of the Peaks, it is advisable to check in with BLM for safety updates and current road information. This Map encompasses a large portion of the Monument. Therefore, when first displayed, the Map is un-readable. You must expand the Map on your computer and scroll to the area you are interested in. The Map encompasses Ragged Top, Silver Bell Mountains and the Waterman Mountains . To further complicate the situation there are two versions of this Map. One version does not have GPS waypoints on the Map. The other version does. The routes on the Ragged Top Map contain four DM hikes to the summit and volunteer work hikes in the immediate area. On a side note, the BLM requests that hikers refrain from hiking above Wolcott Saddle and summit-ting Ragged Top from January 1 through April 30 during the Big Horn Sheep Lambing Season. The route on the Silver Bell Map is a hike to the Peak and volunteer work hikes in the immediate area. The route on the Waterman Map is route to the Peak, many volunteer work hikes in the area and extensive work at the Allyson Kamataka Restoration Site. All of the information shown on the Ragged Top, Silver Bell Mountains and Waterman Mountains Maps also appear on the Ironwood Forest National Monument Map. DISCLAIMER: Dove Mountain Hikers is a group of friends who hike together. There are no hiking leaders and all those who participate are responsible for determining that they are adequately prepared to engage in such activities and that they do so solely at their own risk.